“Therefore be merciful, even as your Father is also merciful” (Luke 6:27-36, also Matthew 5:43-48). Jesus said to him, “‘You shall love the Lord your God with all your heart, with all your soul, and with all your mind.’ This is the first and great commandment. A second likewise is this, ‘You shall love your neighbor as yourself.’ The whole law and the prophets depend on these two commandments” (Matthew 22:35-40, also Luke 10:26-27). “A new commandment I give to you, that you love one another. Just as I have loved you, you also love one another. By this everyone will know that you are my disciples, if you have love for one another” (John 13:34-35; also 15:12, 17). 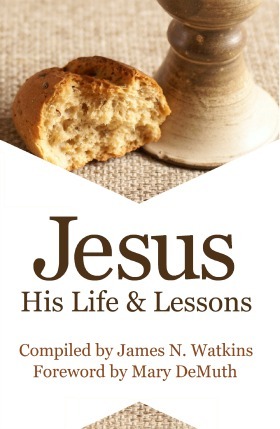 Excerpted from Jesus: His Life and Lessons This user-friendly book arranges his life in chronological order and His teachings by topics, plus a glossary to make it even easier to explore the gospels. No commentary, no doctrinal states, just 100% Jesus. A perfect gift for anyone seeking to learn more about Jesus. Buy one for yourself and another for a friend.